Cal, as remembered by his nephew, Ritchie. Appearance: Thin and tall, but with a wiry strength from years of farm work and his time in the Navy. Cal has dark hair and eyes, and a fair complexion that becomes tan and hardened from his time in the sun. He has high cheekbones, and a straight, strong chin and nose. A straight brow above deep set eyes that make him seem pensive and brooding, which he usually is. Other Names: Cal—only his mother calls him Calvin. Fellow seamen called him Tight Lip during WWII. Physically: Matthew McConaughey in True Detective. Cheekbones & accent. Goals/Desires: To take care of his own—family, country, fellow seamen, life, farm, land. 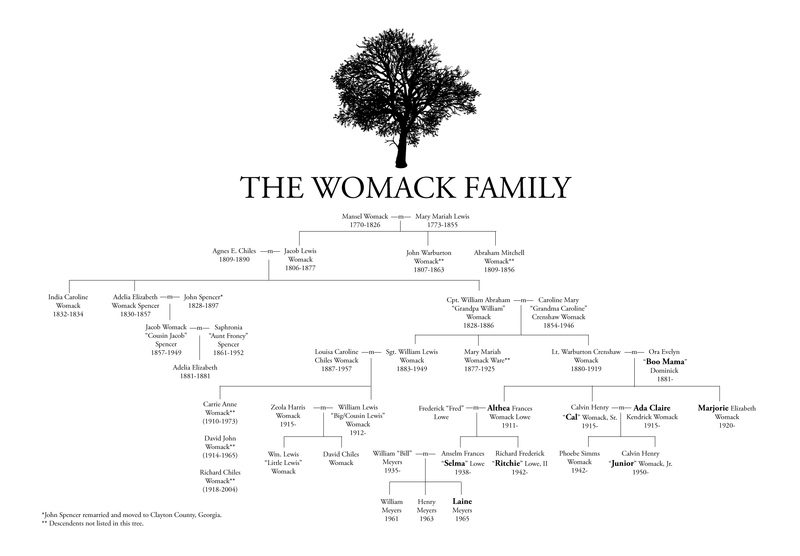 Cal is, for much of his life, the sole male heir to the family farm and the last male Womack. His father died when he was a very small child (in WWI) and Cal struggles with living up to his father’s name, and the ghost he left behind. Leaving behind something of himself for a future generation—showing his time on earth wasn’t spent idly. Being able to leave the farm to his children and see it go on. During the war, Cal struggles with getting leave while many of his fellow crewmen did not. Secrets: Cal knows that his younger sister, Marjorie, has a different father, but unlike Althea, he actually knows who that person is. Quirks: Cal smokes Marlboro Reds and prefers Crown Royal. He goes to church every Sunday, but will only sing at the behest of his mother. He’d sing a church solo if she asked. Temperament & Personality: Stoic, chooses his words carefully because he hates talking, stern but caring, doesn’t tolerate things going against what he knows and believes. Cal is usually practical. While he will rant about the “infernal cussedness” of modern technology, he tends to approach most challenges in a straightforward “It can be fixed” or “It can’t be fixed” sort of manner. He’s not a wisher and hoper, and so it’s hard for him to “get his hopes up” about something because he tries to base feelings like that off life experience and facts. Again, God’s Will mentality—if it’s meant to happen, it will. No stomping or kicking or cussing is going to make something happen that God doesn’t mean to happen. Cal cares about his family beyond measure, and though he might not vocalize or show it physically, he does intentionally make decisions and choices for their betterment, though they may not ever know it. Cal is also stubborn. Once he makes his mind up about something, that’s that. His stubbornness and dignity often make him immovable, or unable to see past his own prejudices. Religion: Methodist; Cal believes in justice and God’s will, and finds moral struggle only when those two things conflict. He doens’t understand why good people receive misfortune, and why the wicked remain unpunished. He usually justifies this to himself by remembering that God’s Will will be done on Judgement Day. Likes: These top 10 United Methodist Hymnal Favorites, particularly “Be Thou My Vision.” (It might make him tear up a little. Shh.) Other likes: his horse; cows (it seems silly to say it like that, but he likes working with cows and farming;) flying; his wife, and spending every evening with her listening to the radio; Flying—he’d like to buy his own plane someday. He builds balsa wood model planes in his spare time. Occupation: Farmer, former Navy Lieutenant.